Waiouru: Amazing what one foot can do! Amazing what one foot can do! The DTV signal on the mooring at Brownsover has been quite erratic. Sometimes it’s good and then there are bouts of pixilation. I tried realigning the powered directional aerial but it didn’t make a great difference. We don’t normally have a problem as we either get DTV or satellite or even both. But Jan wanted to record a program on the Freeview TV which meant using the DTV aerial. Last night I was so frustrated I did something we haven’t previously tried. I extended the aerial by one foot (30cm), which was the maximum height I could gain out of the existing coaxial cable. Suddenly we had a clear, strong signal. So today I fitted an extension to the coaxial cable which enables us to raise the aerial to it’s maximum height. At this height we should be able to pick up a signal from France! Having learned this lesson I had to take down the mast because we moved to our winter mooring at Clifton Cruisers. Somehow I didn’t think the mast would fit under the bridges. There was a break in the weather and for several minutes the sun appeared. We decided to “seize the moment” and move. Everything went without incident until we passed the entrance to the disused arm at Clifton Cruisers. At that moment we got something serious around the propeller. Moreover a hire boat appeared from the opposite direction. The boats are moored three abreast here with almost no room to pass, and we were ‘dead in the water’. I indicated by hand signal to the hirer to stop (he didn’t) whilst I attempted to clear the propeller. The major obstruction was one of those coir tubes wrapped in netting which BW use to protect the bank from eroding. It was well wrapped around the propeller and shaft! So there I was lying on a wet and muddy deck with my shoulders down the weed hatch welding a bread knife. Of course the Tshirt was clean on that morning! Eventually we got everything sorted and discussed the location of our winter mooring with Victoria. Then it was a case of reversing back past the breasted up boats before manoeuvring against the bank. There are a number of other boaters ‘wintering over’ so we won’t be lonely. 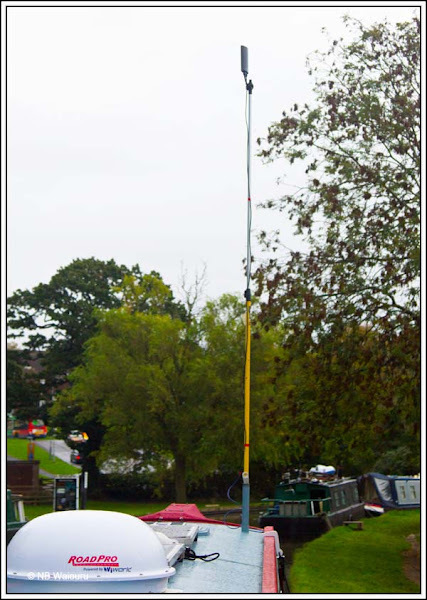 The DTV aerial is back up (but only to the first stage) and we also have the ‘dot in the sky’. The Refleks flue has been fitted in anticipation that at some stage it will start to get seriously cold. Shore power is being organised. Interestingly, our CRT licence for the next 12 months has arrived,,,,,,. Fast service. I only completed the online application two days ago! We’ve been told the CRT enforcement officers don’t use the displayed licence to check if the boat is compliant. Rather, they used their mobile data terminal and the boat index number. One assumes the displayed paper licence is for the benefit of other boaters. It seems to me that CRT could save some money by modifying their licence application system so boaters who apply online can also print a copy of the licence if they want. It would save CRT the cost of printing and postage. Moreover, it would make it easier for the likes of us (continuous cruisers) who don’t have an address. I suspect there are a few boaters who have streamlined the licencing system even more than you suggested by skipping the entire application process and just printing their own licence. Fortunately the subtle differences in colour etc. and the fading in sunlight from home printing distinguish them from the real thing – as long as we can’t all print at home. LOL..... Actually I don't suppose it's too hard to scan and modify you current licence! Hopefully the door solution will work!